Liverpool midfielder Joe Allen has ruffled a few feathers by appearing on the front cover of Chicken & Egg magazine. For most footballers, the recovery time they get after training and between matches usually means plenty of golf, or computer games. But saving birds by re-homing them after they have finished their commercial lives is what keeps Wales international Allen busy. 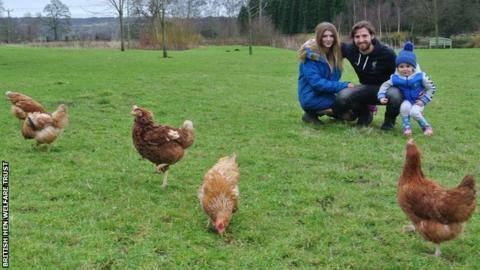 "The football can threaten to take over at times but spending time with my family and pets is very important to me so I always find a way to get the right balance," he told the British Hen Welfare Trust publication. Allen, though, isn't the only professional player using his downtime in a different way. Arsenal goalkeeper Cech fills his time by performing fills - on his drum kit. The Czech Republic international posts videos online showing him drumming along to rock bands like the Foo Fighters. He credits drumming with improving his keeping skills too, recently telling the Arsenal Weekly podcast: "It is especially useful for a goalkeeper. There are so many things I learn on the drums that I can use in goalkeeping as well, because the hand-eye coordination and the independence on each of the limbs is helpful." Cech showed off his musical skills in a Christmas video for the Arsenal foundation, alongside team-mates Alexis Sanchez and Nacho Monreal. The former Liverpool defender is now playing back home in Denmark, at Brondby. The prototype inked footballer was one of the first to sport tattoo sleeves but is also capable of etching his designs onto others - he's a qualified tattoo artist. The Russian ex-Arsenal forward is still playing for Kairat at the age of 34, but when his career ends he can still fall back on the fashion design skills he learned at university, where his thesis was on tracksuit design. Turns out he's pretty handy with a needle and thread, too. Tottenham and Manchester United fans used to say he was an artist when he played in the Premier League. Now playing for PAOK in Greece, the Bulgarian striker is as deft with a pencil in his hand as he is with the ball at his feet. He has posted sketches of rapper Snoop Dogg, actor Marlon Brando and the Breaking Bad cast to his social media accounts. The Everton full-back, 35, has not made a first-team appearance this season, which will have given him more time to focus on his carp fishing empire. Like Allen, Hibbert was a cover star of a non-football magazine - the Angling Times - in 2013 after catching a 42lb beast at his private fishery in France - the aptly named Lac de Premiere. An ex-Millwall centre-half with a love of felines. The 37-year-old former Premier League defender is now captain at League Two Yeovil Town, but has a family business on the side - a cattery in Hertfordshire. BBC Sport visited the cats home in 2011 and Ward said: "Playing for Millwall you've got to be thick-skinned. You do get some eyebrows raised and a few giggles." Put a plate full of wild mushrooms in front of ex-Barcelona and Spain great Xavi Hernandez, and he'll be able to name every one. The 36-year-old, now with Al Sadd in Qatar, loves nothing more than foraging for fungi - or to give it its official term: mycology. Quiet but ruthless: Who is Pochettino? Read more on Mauricio Pochettino: Just who is the man behind Spurs' title bid?